This oceanfront hotel offers beachside accommodations is your perfect location, in driving distance to the Daytona International Speedway, and easy access to all that Daytona Beach has to offer. 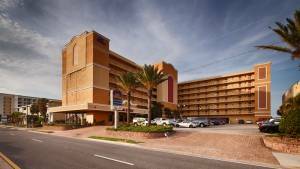 Retreat to the newest hotel in Daytona Beach, Florida! Welcome to the Best Western Daytona Beach, the best choice in lodging while visiting the Daytona Beach, Florida area. This newly remodeled property highlights an oceanfront fire pit for social gatherings and a convenient location to area shops and restaurants. Relax just steps from the beach whether you prefer sunbathing, swimming, jogging or just lounging with friends. Located in the Heart of Daytona Beach. Enjoy the Pool or 23 Miles of Uninterrupted Beach. Only Minutes Way from the Daytona International Speedway.